I had so much fun plating this dish as a tower I felt like a little kid playing with blocks. The kitchen is definitely my big girl playground. It was my quick lunch after yoga and before work. I had a couple hours to spare to make something to eat and get ready for work, and never would my lunch be something super simple. Used my favourite simple spices, coriander, cumin, chili powder and I love just a hint of sweetness from honey. Plating is always fun for me. It’s art and finally time to play with your food! 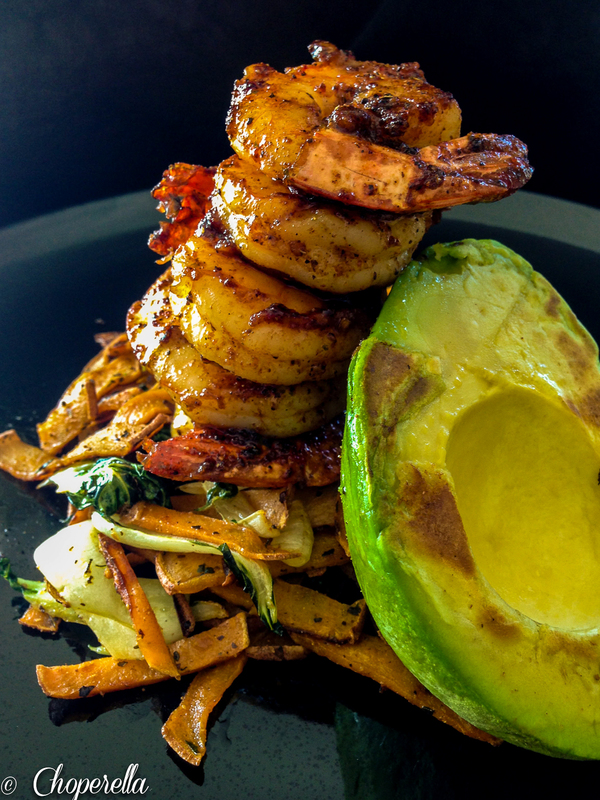 I decided this meal was going to be focused on height, so I piled up the shrimp on top of the hash, leaning them on the seared avocado and bam! 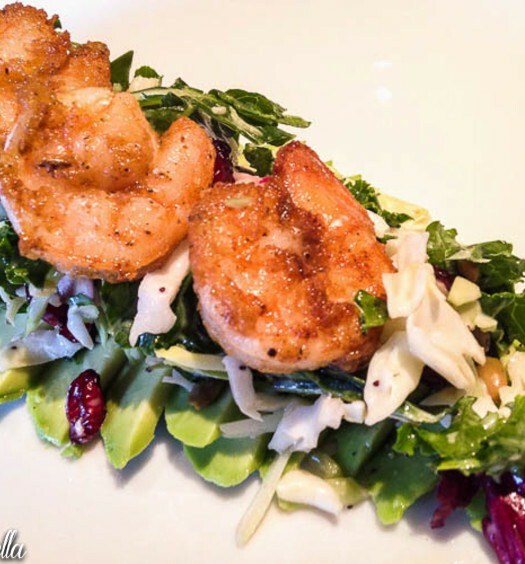 I managed to snap a couple shots until I guess I moved the plate somehow and the shrimp toppled…..but so perfectly. The fell into such a neat row, I smiled. It’s like they knew what to do. 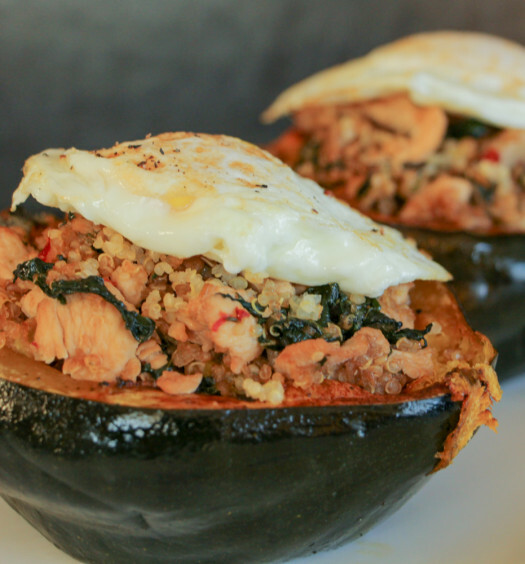 It’s up to you how you want to plate this dish. Be creative and have fun! 1. Peel and devein shrimp, leave tail on and rinse. 2. Heat coconut oil on medium heat . When oil is hot, saute sweet potato slices. When they have some brown around the edges, about 4-5 minutes. Place bok choy in and sauté. Sprinkle 1 tsp coriander powder and a couple pinches of salt, sauté for a couple minutes until bok choy has wilted slightly. 3. Once potatoes and bok choy is cooked, move to the side of the pan. While pan is still hot, place half the avocado on the pan and let it sit there to sear. Turn off the heat and leave to sear. In the mean time, let’s cook the shrimp! 4. Heat coconut oil in a pan on medium high to coat the bottom. Toss shrimp with salt, pepper, chilli powder (to taste, if you like spicy- add more if not you can omit) cumin powder and coriander powder, mix. 6. 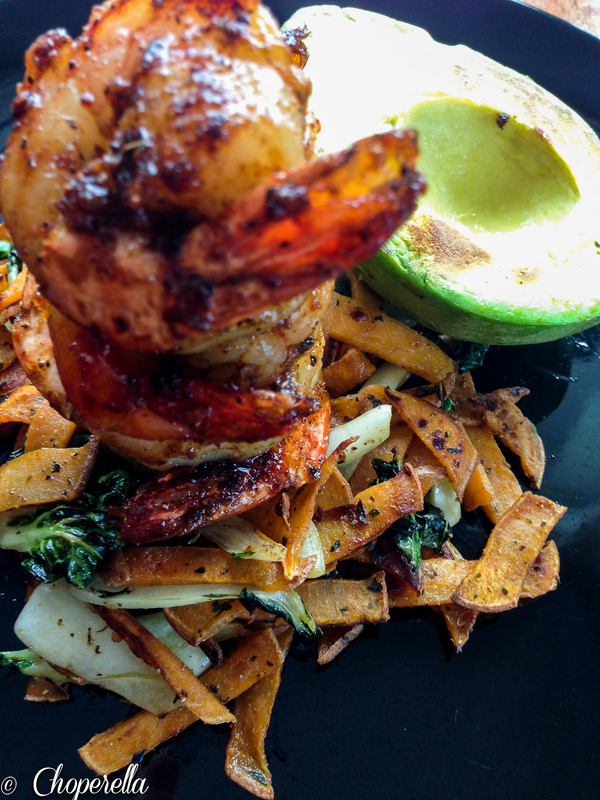 Plate the bok choy, sweet potato hash on the bottom and pile the shrimp in a tower on top. 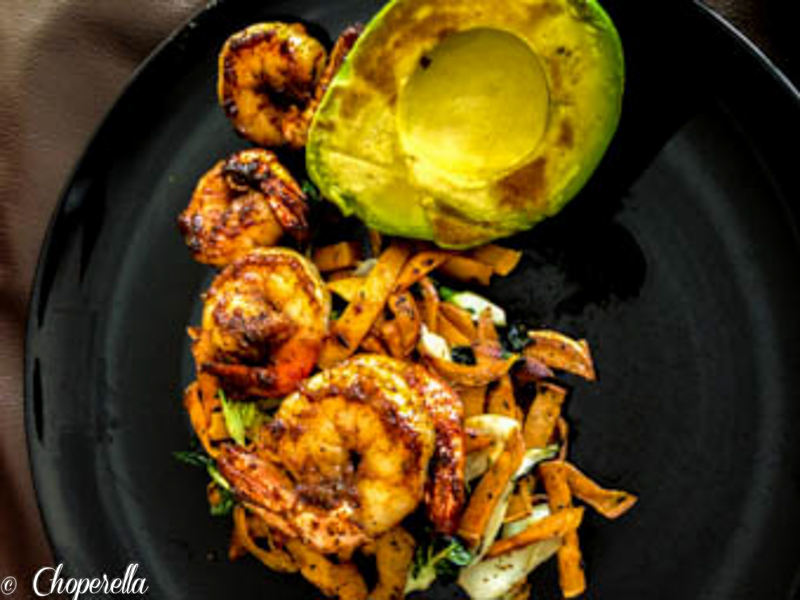 Use the avocado as a support to lean the shrimp. OR have fun and plate it however you’d like!